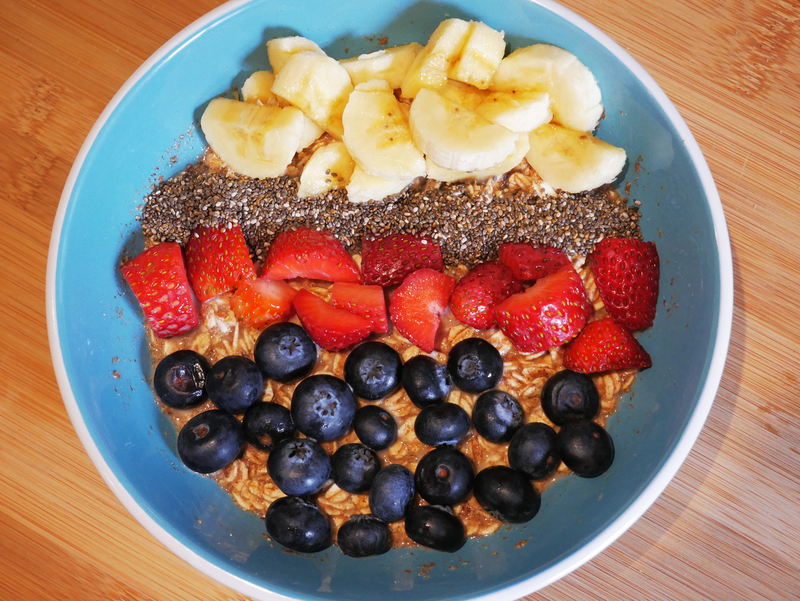 Amelia got this Raw Rolled Oats Breakfast idea from her Plant-Based Certification program. 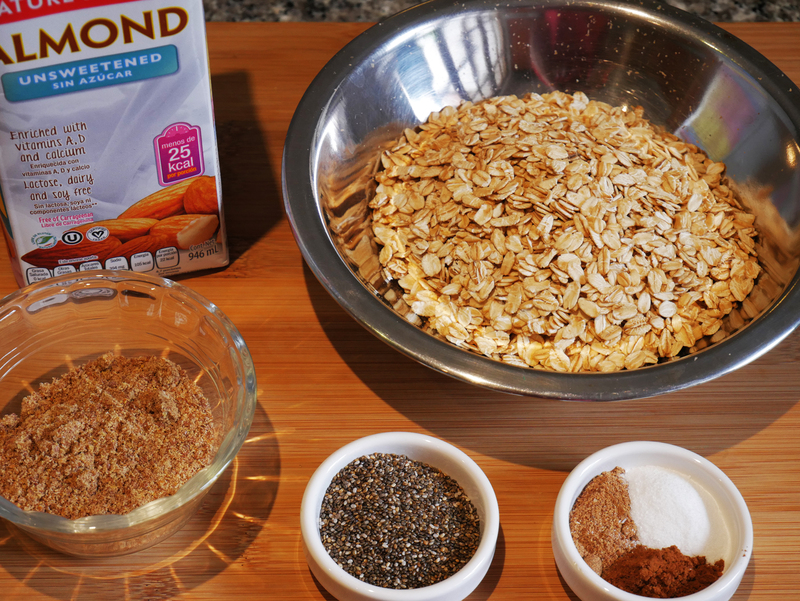 We never thought to eat uncooked rolled oats before, but they’re absolutely delicious! They’re also very filling and last both of us all the way to lunch. 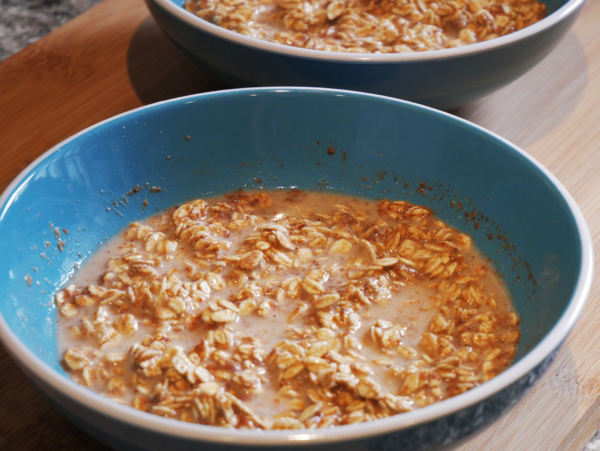 Think of this Raw Rolled Oats Breakfast as a hearty cereal. 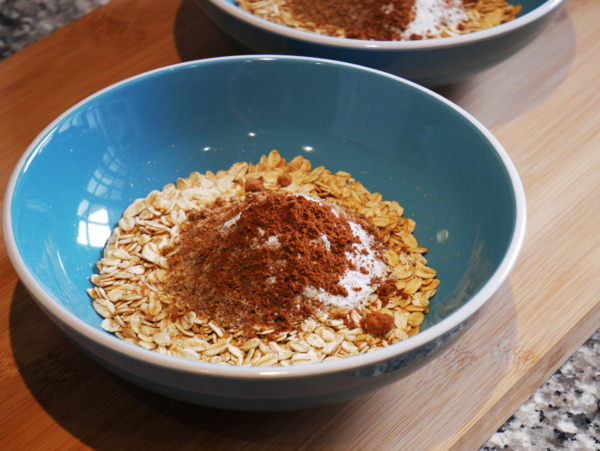 You wouldn’t cook cornflakes or bran flakes before eating them, and you don’t need to cook your rolled oats, either. We don’t recommend steel cut oats, though. They’re a little too tough to eat uncooked unless you soak them overnight using a recipe like our Vegan Overnight Oats. 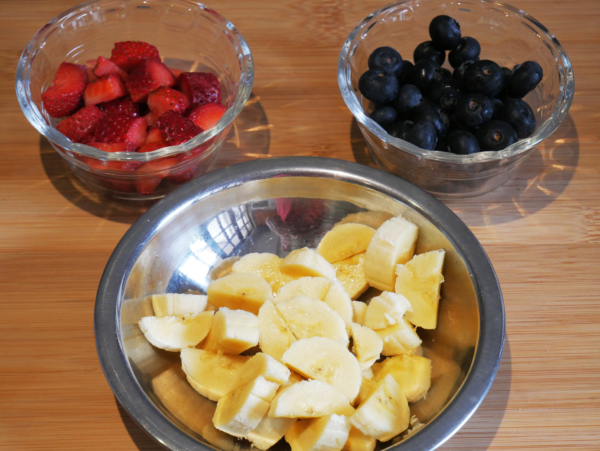 We had blueberries, strawberries and bananas on hand, so we used those, but you could also use mango, papaya, raspberries, blackberries, dragon fruit, peaches, apples or your favorite fruit. Dried fruit like cranberries or raisins are also good additions, especially if you’re out of fresh or frozen fruit. Some chopped almonds, pecans, walnuts or hazelnuts would also taste great. And we also like to add maca powder, sunflower seeds and pumpkin seeds when we have them. We use stevia to sweeten our oats because we don’t have a lot of healthy sweetener options here in Ecuador. Applesauce is a rare find. Maple syrup must be imported from Canada so it’s about 4 times as expensive here as it is in the states. Blackstrap molasses is unheard of here. So is U-Sweet. Sometimes we use agave syrup, but it tends to be bitter here, so we’ve started using stevia. We encourage you to use the smallest amount of the healthiest sweetener you can find, or skip it entirely. We added both ground flax seeds and unground chia seeds. They’re both good plant sources of omega-3 fatty acids, which are really important for vegans to consume since we don’t eat mercury and chemical laden fish. Greger recommends 1 tablespoon of ground flax seeds per day as part of his daily dozen, so you’ll get the whole amount in this one meal. It’s important to grind the flax seeds or they’ll pass right through you without the nutrients being absorbed. Greger recommends grinding the chia seeds, too. Some studies suggest your body will better absorb the omega-3’s contained within chia seeds if they’re ground. Sometimes we grind them. Sometimes we don’t. You can just add both seeds to your coffee grinder and grind them up together if you want to. We’ve also started adding amla powder to our oats in attempt to lower my cholesterol. You can read about my ongoing battle in “Can Vegans Get Heart Disease?” Amla powder is Indian gooseberry extract that has been used for thousands of years in India to treat all sorts of ailments. More recently, it has been shown to perform as well as two leading statin drugs at lowering cholesterol so we decided to give it a try. It’s too early to determine if it’s helping, but we’ll keep you posted. If you don’t have any non-dairy milk on hand, you can use water or juice. We got this trick from Dr. Esselstyn’s book, “Prevent & Reverse Heart Disease.” Ecuador hasn’t caught up to the states in the non-dairy milk category, so it’s not widely available. When we’ve travelled here, the hotels and B&B’s often have oats, but no non-dairy milk. They do have the most amazing fresh squeezed juice, though. I especially like fresh squeezed naranja, papaya and mango juice in my oats. Yum! Despite the sheer volume of food contained in one bowl of this Raw Rolled Oats Breakfast, we sometimes still feel hungry after eating it. 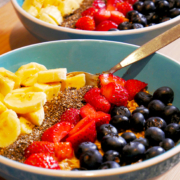 A glass of water takes care of that, causing all of the oats and seeds to expand in our stomachs, and makes this hearty breakfast last several hours without the need for snacking. 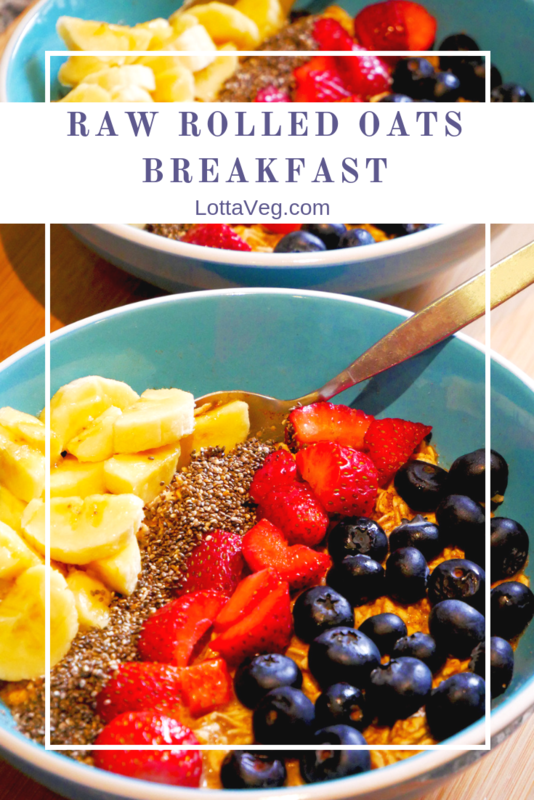 Breakfast is the most important meal of the day and it should be the most filling while containing low glycemic foods that slowly release their glucose over several hours. That will keep your hunger at bay and prevent you from snacking before the next meal. If you haven’t read it yet, we highly recommend reading “Breaking the Food Seduction” by Dr. Neal Barnard. He goes into great detail about the benefits of eating oats for breakfast in terms of weight loss and overall health. This Rolled Oats Breakfast is so filling it'll keep you full all the way to lunch. Don't cook the oats. Just add milk and enjoy a hearty breakfast. Assemble your ingredients. You don't need to display them so nicely, but it's a good idea to get everything out on the counter so you don't forget anything. We keep all the dry ingredients together in our cupboard so they're faster to retrieve. We wash our fruits and veggies, and cut up our strawberries when we get home from the mercado so they're ready when we want them. Add half of the dry ingredients to each bowl. Don't cook the oats. They're delicious raw. Add the non-dairy milk, water or juice and stir to combine. Top with fresh, frozen or dried fruit, and some nuts and seeds if you like. 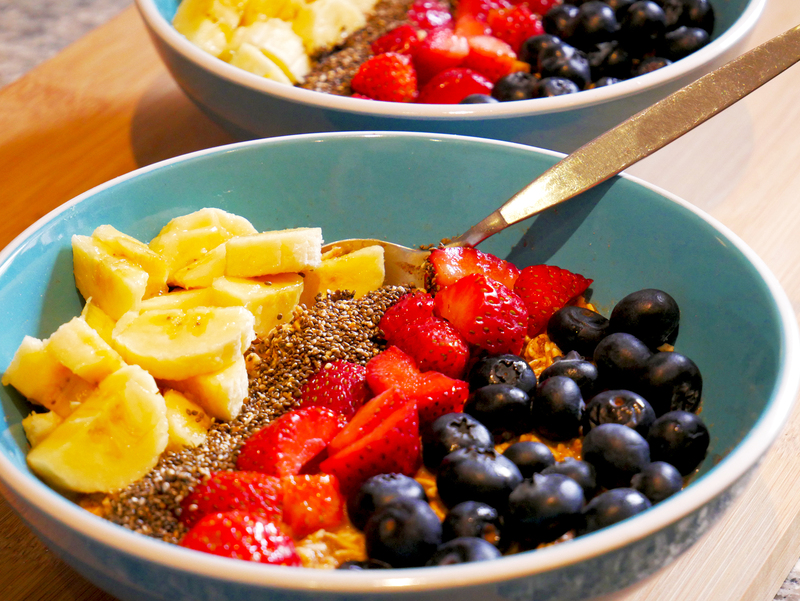 Follow this hearty breakfast with a glass of water so the oats and seeds expand in your stomach and keep you full longer. Serving size is one full bowl and one full stomach.